Look into yourself, And you'll see the reflection of the world. Look into the people near you And you'll see the reflection of yourself. 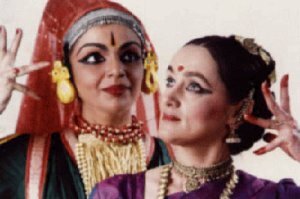 Based on Indian mythology, German poetry and life itself, Anita Ratnam and Alexandra Romanova developed an evening-length work which toured Germany in June, 1997. 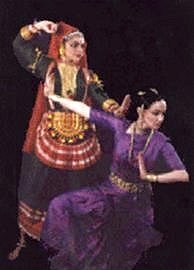 Pratirupa: The Mirror Image, was a sequence of ten dances, each focusing on an individual woman. Are India and Europe really different? 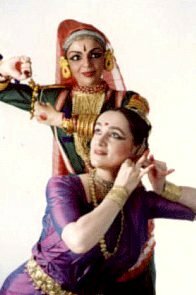 The two dancers present the common factors in the image of the "Divine Mother" in her idealised form and as she manifests herself in daily life. The Indian "Shakti" (the creative energy and life-giving primordial power) finds a parallel in the European "Pieta" (mother of God) with her unconditional love, her willingness to sacrifice and bear suffering. 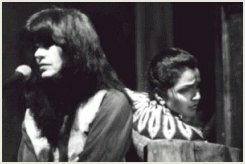 Driven by the common concerns of women in society, Ratnam and Romanova evolved Pratirupa over six weeks of discussion, research and workshops. 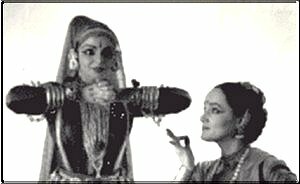 An invaluable asset to this Indo-German production was the musical score composed by percussionist Selva Ganesh and guitarist Rikhi Ray. 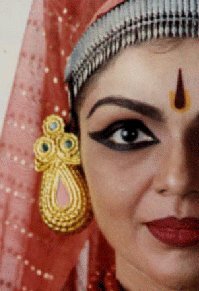 Using his knowledge of Hindustani music, Ray created special musical elaborations based on the Indian system of 'alaap' which floated through Romanova's dancing grounded in ballet and Bharatanatyam.. 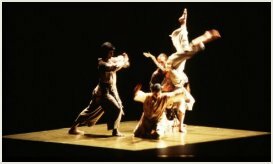 Powerful, disturbing images as woman and woman faced off against one another - flirting, fighting and testing the boundaries of the other's psyche.